Mugsy's Rap Sheet » How Does One Support Hillary without rewarding DNC misbehavior? It’s a question I’ve been asking myself for a while now: After everything the Democratic National Committee did to rig the primary in favor of Hillary Clinton, how do I, as a Bernie supporter, “reward” the DNC by voting for their hand-picked candidate? And will it even be necessary? Back in February, I wrote a long Op/Ed entitled “I’ll Support Hillary [if she becomes the nominee], but…”. Now I find myself wondering about the consequences of doing so. There’s a not-so-old saying: “When you vote for the lesser of two evils, you’re still voting for ‘evil'”… not that I think Hillary is “evil” (though many might disagree). It’s like in the movies when the bad guy says, “You can arrest me or stop the bomb, but you can do both”, so the intrepid cop must let the mad bomber go KNOWING they’re going to do it again. And I just KNOW that if I reward the DNC by voting for the candidate they hand-picked, they’re going to do it again having learned they can thwart Democracy as well as any Republican without consequence. You may be asking: What exactly did the DNC do that was so bad? Well, starting from the beginning, scheduling only four debates last year between the Democratic nominees was bad enough when the front-runner is a household name (former First Lady for eight years, Senator from New York, ran for president in the 2008 election in a dead heat that stretched into June, then Secretary of State for four years, vs a relative unknown like Sanders (and O’Malley who was never even close), but ensuring those competitors STAYED unknown by scheduling those debates on Friday & Saturday nights… one even opposite an NFL Playoff game. The DNC even publicly criticized Sanders mid-campaign, taking Clinton’s side after she refused to say Sanders was “qualified” to be president, leading Sanders to react to an inaccurate newspaper headline by questioning Hillary’s own qualification to be president by questioning her judgement (not unheard of between competing candidates). When has the DNC ever taken sides in a debate between two Democratic candidates? Apparently, even AFTER Senator Sanders announced his candidacy, nearly a month later, the DNC sent out a memo stating their “goal” was to help “HRC” (Hillary Rodham Clinton)… not “the eventual Democratic nominee”… defeat the eventual GOP nominee. Keep in mind that at the time, there were FIVE Democratic candidates (Clinton, Sanders, O’Malley, Webb & Chafee), but the DNC was ALREADY in the tank for Hillary. And why not? The head of the DNC… Congresswoman Debbie Wasserman Schultz… was a former spokesperson for the Clinton campaign in 2008. So the fix was in from the beginning. Hillary was going to be the Democratic Party’s nominee come hell or high-water. It bugs the hell out of me when I hear people say, “Hillary won fair & square“. No she didn’t. On what planet is ANY of the things I mentioned above considered “winning fair & square“? I have no doubt the DNC was surprised as hell that a relative unknown like Sanders could pose such a formidable challenge to Hillary. We’ve all seen the photos of enormous crowds showing up to Sanders rallies: 20,000, 30,000, perhaps even 100,000 people flocking to support the Senator. I have challenged Hillary supporters for over a month now to produce a single verifiable photo of a Clinton rally that approaches the massive crowds that came out in support of Bernie (even offering a free BluRay player) to justify the idea that support & enthusiasm for her is just as great as it is for Bernie, thus explaining away her easy wins & delegate lead that has all but assured her of the nomination. 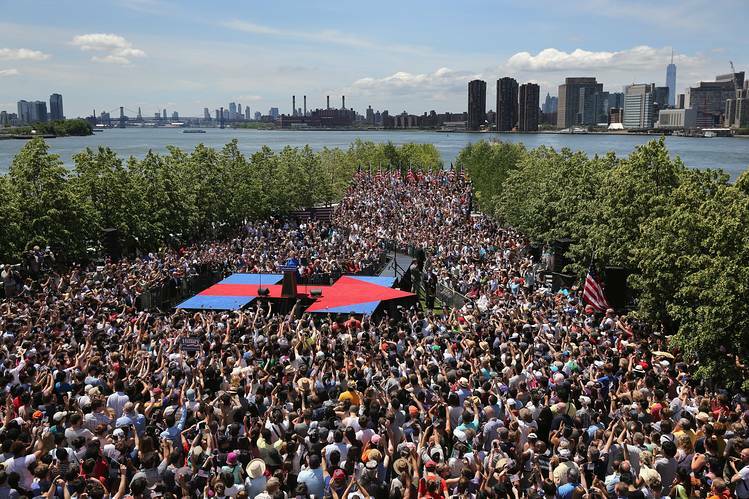 Searching on my own, the largest crowd of a Clinton rally that I could find was 5,000 people crammed onto tiny Roosevelt Island, NY. Nothing else even approached the numerous overflow crowds flocking to Sanders. Former Liberal Champion turned lobbyist & Clinton supporter Howard Dean tried to “explain away” Bernie’s huge crowds citing his own massive popularity from the 2004 race: “After a while, you start to see the same faces in the crowd over & over again.” The problem with that explanation is (among other things), it doesn’t explain why Clinton’s crowds were so much smaller. If she doesn’t have “enthusiastic fans following her from state to state” like Bernie supposedly does, wouldn’t that ALSO point to an enthusiasm gap? Somehow, I don’t think the same 20,000 fans are following Sanders from Kentucky to Michigan to California. Is Dean saying the polls that showed his own huge popularity prior to his implosion were all wrong and he was never really that popular to begin with? I’m sure that’s what he told himself every night for years afterwards rather than blame his failure on himself. 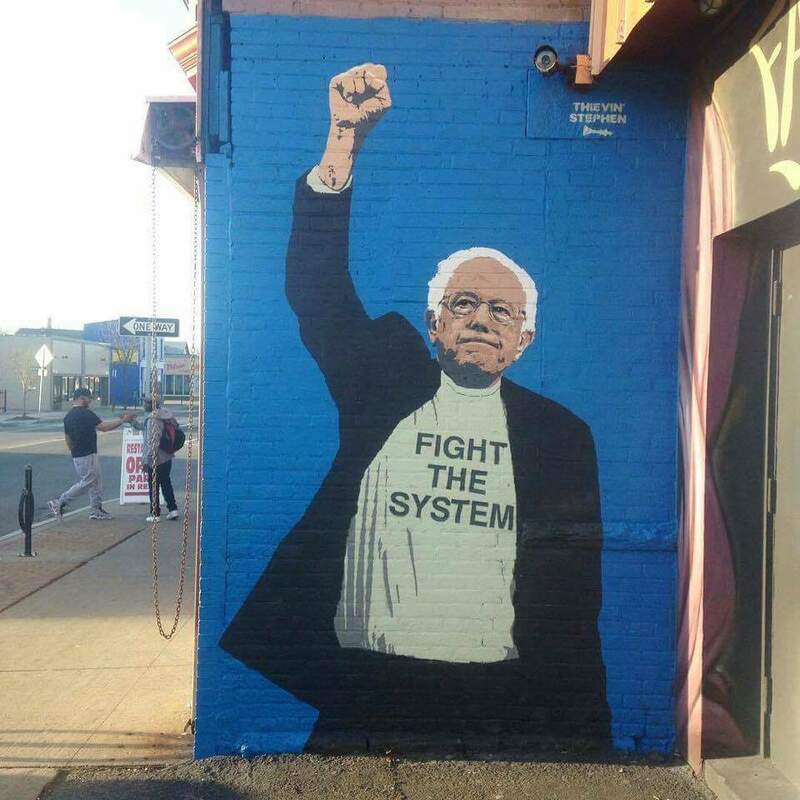 So now, we, as Bernie supporters, may be forced to chose between the candidate the DNC rigged the election for to ensure was our nominee, voting for a third-Party candidate and gamble that doing so doesn’t allow Donald Trump to win in an unnecessarily close contest that Clinton could potentially lose without Sanders voters, or (most distasteful of all), actually voting for Donald Trump for any number of reasons, not the least of which: payback for the DNC rigging the election against our preferred candidate. (Note: 2020 will be a MUCH bigger election than 2016 since it will be a census year… which means the Party in control of Congress will redraw the district maps for the whole damn country. The chances of a FOURTH 2-term presidency in a row is extremely slim. Before Obama, we had never had more than two in a row. The thought of giving the GOP time to get its act together to put forth a better candidate to defeat an unpopular Clinton presidency in 2020 is worrisome. Maybe letting an extremely unpopular GOP candidate win now so they are strapped with rallying behind him again in 2020 might not be the worst idea in the world. The fly in the ointment? It doesn’t take a Republican very long to create global chaos & economic disaster. George W. Bush had only been president eight months when his incompetence led to 9/11. Followed 18 months later by the invasion of Iraq (the consequences of which we are still dealing with today.) So there’s THAT. The list of reasons why Bernie supporters just can’t see themselves voting for Hillary is long. It has become painfully clear that the rules just don’t apply to the Clinton’s. My qualms with Bill were mostly on a personal level (his minor infractions were rarely connected to him seeking political power), but Hillary is FAR different. Every “controversy” surrounding her leads to “ambition” & political power. Now, I personally don’t think “Hillary’s email” is a big deal. Mostly because I don’t think anything of great significance was compromised. But what IS a big deal is the SECRECY, the PATTERN of ignoring the rules and circumventing them when they prove inconvenient. She KNEW her private email server was a security risk. Her own personal tech consultant hired to maintain the server (at quite some expense) had informed her of at least two failed hacking attempts. We know this because it came out in the State Department’s internal investigation. Yet she did not inform the State Department of the attempted hacking. Now remember, the State Department ALREADY provides their employees with FREE secure email hosting, and if anything goes wrong, it’s on THEM. Yet Hillary… at great personal expense (and inconvenience should the server go down)… chose to use a personal email server, which entailed hiring someone to build, secure, run & maintain. Why? The most obvious answer is “secrecy”. What she wanted to keep secret was anyone’s guess. Was she soliciting foreign donations to The Clinton Foundation in her capacity as Secretary of State? That would be illegal. But it also wouldn’t have fallen under “official business”, so when she says she “only deleted personal email”, “evidence” could very well have been destroyed forever. Currently, the defense of Hillary Clinton using a private email server seems to boil down to “no evidence of a crime”. Is that the standard by which Clinton intends to run her White House? But the secrecy doesn’t end there. What about those Wall Street speech transcripts she keeps finding new & creative ways to avoid releasing? What did she say in those speeches she doesn’t want voters to hear? She says it’s nothing that might make her look bad, but we KNOW if those speeches made her look GOOD we would have seen them by now (as evidenced when she released a single 15 minute clip talking about equality for women in the workplace from one of 42 hour-long speeches.) Is she hiding something damaging? Clinton has done more to reach out to Republicans than Sanders voters. Who are all those anti-Trump ads intended to sway? Democrats? The most she has said to supporters of Bernie is that “We must unite to defeat Trump”… which is NOT an argument to vote FOR Clinton or to drop support for Sanders. “First woman president” & “defeating Trump” are not terribly convincing arguments to abandon one’s principles and rally behind a candidate you believe was “gifted” the nomination like a birthday present… pretty bow & all. The DNC has become GOP-Lite. Their standard-bearer is a Closet Conservative that has done NOTHING to reach out to Sanders Supporters. Tell us again why we should support Hillary? Meanwhile, her supporters do nothing but attack THE most Liberal member of Congress (#1 Bernie vs #12 Hillary), call him (and his wife) juvenile names, and instead of welcoming him/us into the fold, they try to get him kicked out of the Democratic Party (numerous petitions). And when I/you point out all the open hostility towards both us and Bernie, their reaction isn’t one of contrition but “We don’t need you! We can win without you!” Their arrogance surpassed only by their ignorance if they think Hillary’s lead is so large & solid that she can simply dismiss (at least) 8.5 million voters. So how do I vote for someone that is the beneficiary of “election chicanery”, a candidate with an almost Nixonian penchant for secrecy, a candidate that has done NOTHING to reach out to me and address my concerns, and whose supremely arrogant supporters have repeatedly told me “we don’t want you. We don’t need you”? Honestly, I’m not entirely sure I can. In any other election year, Hillary would not stand a chance of victory with an unfavorability rating approaching 60% if she were not so lucky as to be running against a man with an unfavorability rating over SEVENTY percent. The ONLY candidate with a net favorable approval rating is Sanders. Right now there is talk of a possible coup during the GOP Convention to deny Trump the nomination. This chorus grows louder as the gap between him & Clinton grows. What happens at the DNC convention a week later if that coup succeeds? Say the delegates deny Trump the nomination and pick someone more electable to be their nominee like Romney or Ryan? (a possibility I discussed several weeks ago.) Coupled with another potential Hillary “scandal” should someone “leak sensitive information” uncovered in her emails or those transcripts just in time for the Convention, or even uncover misdeeds (illegal fundraising?) that she may have engaged in during her time as Secretary of State? Suddenly, the wisdom of nominating someone with an unfavorability rating in the high-50’s/low-60’s may not seem like such a good idea any more. So don’t be so quick to dismiss Bernie or his supporters. Note to Hillary Supporters: She won’t win without Sanders voters. Start acting like it. First, the amount spent “per candidate” is not divided equally. Bill Gates and I have a combined Net worth of $40 Billion dollars, that doesn’t mean I’m worth $20 Billion dollars. Calculating how much is being spent to protect Bernie based on a *combined* total of how much they spend on ALL candidates is just as ridiculous. FAR more is going to protect Clinton & Trump right now. Video of California ballots where Optical Scan votes for Bernie are found covered using “White Out”. This is criminal and puts the entire election in question.